Some years ago, I was able to catch a Fly Fishing Film Tour in Maumee, Ohio. It made a lasting impression and I always hoped that each year the funding or sponsorship would be found to keep it going. I was excited to learn that the film tour was not only still being produced, but stopping in Cleveland this year. There was no question, I would be in attendance. While my overall opinion on the film tour is highly favorable, I do give honest critques and there were some things I didn’t like. Let me start by saying, none of the negatives were profound enough to outweigh the positives, and I was glad I went and would go again. So let me get the bad parts off my chest. Parking is a genuine pain in the a** around the Cleveland Museum of Natural History. There are very few parking spaces on the street, a small lot at the museum that fills quickly, and a nightmare traffic flow problem at the next closest parking garage at the art museum. The latter option, gives everyone approaching from the right the ability to turn in, while if you need to access making a left turn you will wait an ungodly amount of time – all while making everyone behind you mad that isn’t trying to get in the garage. For the incredible inconvenience, you are treated to $8 parking. Maybe the locals or people that visit routinely know the ins and outs and how to navigate it, to anyone else it was a buzzkill start to the night. I must not have been the only one who thought so, as I heard a museum worker discuss with a patron a “capital project” that included a new parking garage. If true, I’m not one to just complain, I would give to it. The next downfall was the apparent mindset of ‘the more the merrier’. I bought my tickets as a pre-purchase and know there was an “at the door” option for a few bucks more. I’m sure no one was turned away at the door. When it came time to get seated for the film, my wife and I ended up in makeshift rows of chairs at the side of the auditorium. A not so great view of the screen with people behind you putting their feet on the rung of your chair or inadvertently kicking it every 2 minutes. Heard many people commenting around me about it. So now let’s talk about the awesome-ness which is the Fly Fishing Film Tour! 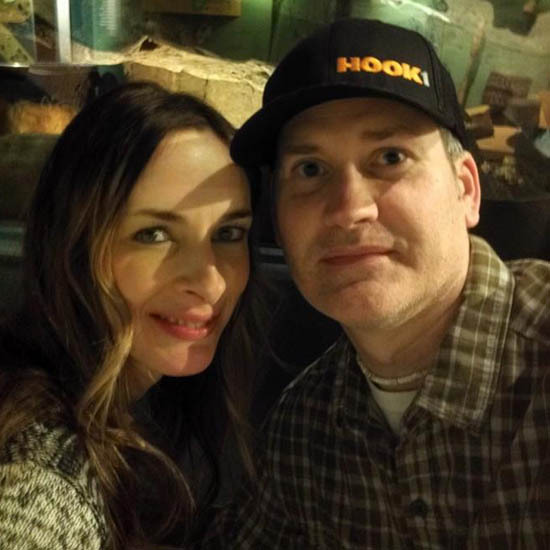 My night started with the same beautiful date I had years ago in Maumee, only instead of being a good looking girlfriend, it was my wife and mother of my two children. It was pretty fun to have a couple people say they had seen her at events at the museum before – even though she hadn’t been there in 30 years. It was flattering to my wife (and I) and she is so humble, it was fun to see her embarrassed by the attention. I know I’m biased, but how gorgeous is she?! Both the event and museum staff were warm and friendly. The reception area was plenty sizable and despite the large turnout, there was no shortage of great tasting free appetizers. Drinks were priced fairly for this type of event at $4 a beer and $6 a cocktail. My beer of choice, a tasty 16 oz. 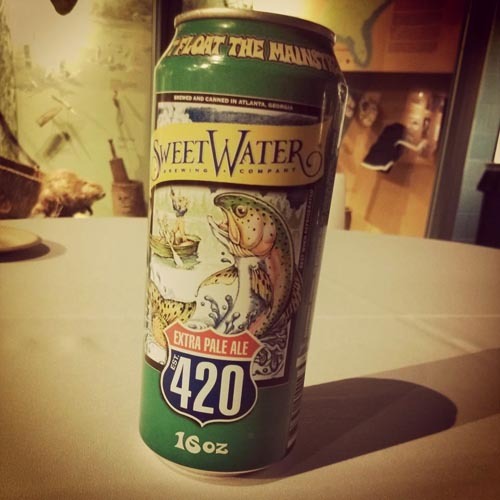 Sweet Water Brewing Company Pale Ale, felt like a steal. I enjoyed the beer and the ‘packaging’ was as cool as I have ever seen – a Steelhead in air with the fisherman in the background standing in a small wooden jon boat. Photo to the left. There were numerous vendor/sponsor tables throughout the corridors. While due to the aforementioned parking, I did not have time to visit many. My wife and I decided food and beverage superseded them, in the limited time before the movie. It did look like people were having a good time checking out the various wares and services, along with entering some raffles for substantially nice prizes. Bummed I didn’t get to participate. So the best is for last. The night is truly about the film(s) and that has never disappointed me in the two events I’ve attended. For those that don’t know, the format is a series of short films that in total, resemble the length of a full feature film. Each short is as diverse and entertaining as the anglers that enjoy the sport. From swagger and style, to humor, serious, and conservation, it is all covered. Some parts light, some heavy, all overwhelmingly entertaining. You leave feeling connected to nature, the fish, and the brotherhood of fly fisherman all over the world. It is a near religious experience. The energy and vibe of what not only is happening on screen, but with the audience, is impossible for me to explain in words. The more obvious and easy to describe moments are when hundreds of people let out an audible sigh and breath of relief when a fish is landed or the collective gasp on a missed strike or fish comes off. I wont go any further explaining – I just want to invite you to experience it. 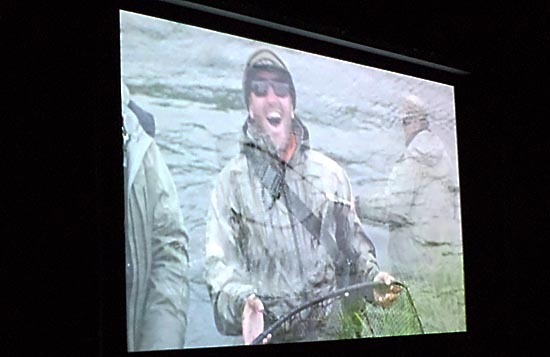 If the Fly Fishing Film Tour is coming to a city near you, don’t miss it!